Are you getting enough healthy fats? They’re essential for fertility, and for your health in general. And don’t forget – good fats are not what make you fat. Sugar and carbs do. Healthy fats are essential for regulating fertility hormones, menstruation, and the timing of ovulation. They increase cervical mucus which helps mobilize sperm when it’s time to meet the egg. Whole fat, organic, raw milk is a fertility superfood. Pasteurization destroys the enzymes in raw milk. Butter, lard, cheese, and cream. Find a good source of healthy meats and animal fats. You’ll want free-range, organically raised animals. Avoid all the antibiotics and hormone drugs found in commercial meat and dairy. Flax (cold-pressed, organic) and borage oil. “Tropical” oils of coconut, palm, and palm kernel. Cod liver oil. It’s an especially good source of Vitamin D over the long dark winter. Trans-fats: essentially, all the “man-made” fats. For example : margarine, cakes, pies, cookies, crackers, microwaves popcorn, breakfast sandwiches, cream-filled candies, doughnuts, frozen pizza and fast food like french fries. Don’t fall for “the cholesterol myth.” It’s a marketing ploy invented by the Statin-drug industry. They want you on their drugs. “Low fat,” and “low cholesterol” are two of the biggest dietary threats to your fertility health. 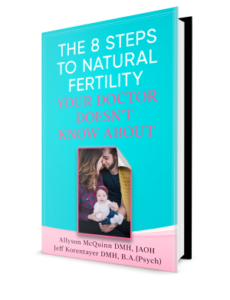 This topic is further expanded in Step 3 of The 8 Steps to Natural Fertility Your Doctor Doesn’t Know About.